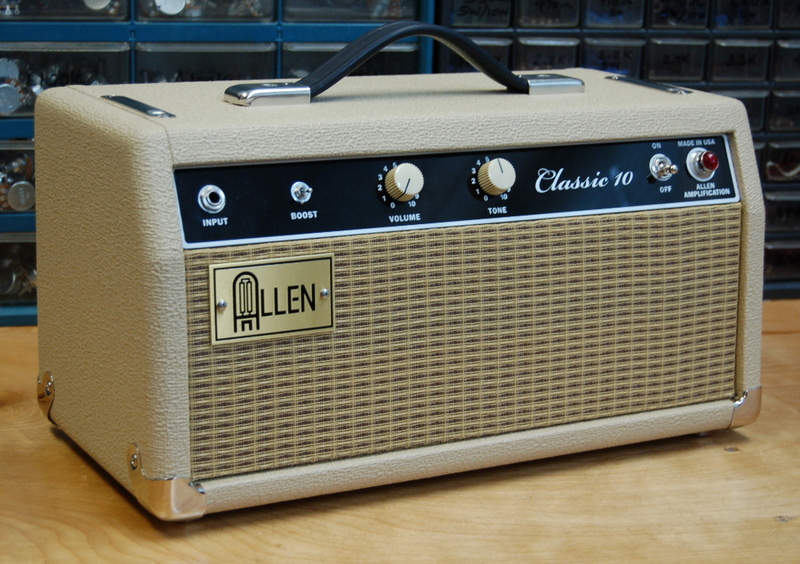 Allen Classic 10 single-ended Class A amplifier. 10 watts of grab n' go fun with a 10" speaker. Straight up VOLUME and TONE controls keep it simple plus a unique BOOST switch to punch up the mids and highs for a more Marshall-like tone. A hot rodded 5F2-A take-off with well-filtered solid-state power supply, Heyboer paper stick wound output transformer (with 4 and 8 ohm speaker jacks on the back), cathode biased 6L6 power tube and high-gain 12AX7 based preamp. An Eminence Copperhead speaker in a generous sized 17" by 17" cabinet make this the ultimate practice/recording/small gig amp. 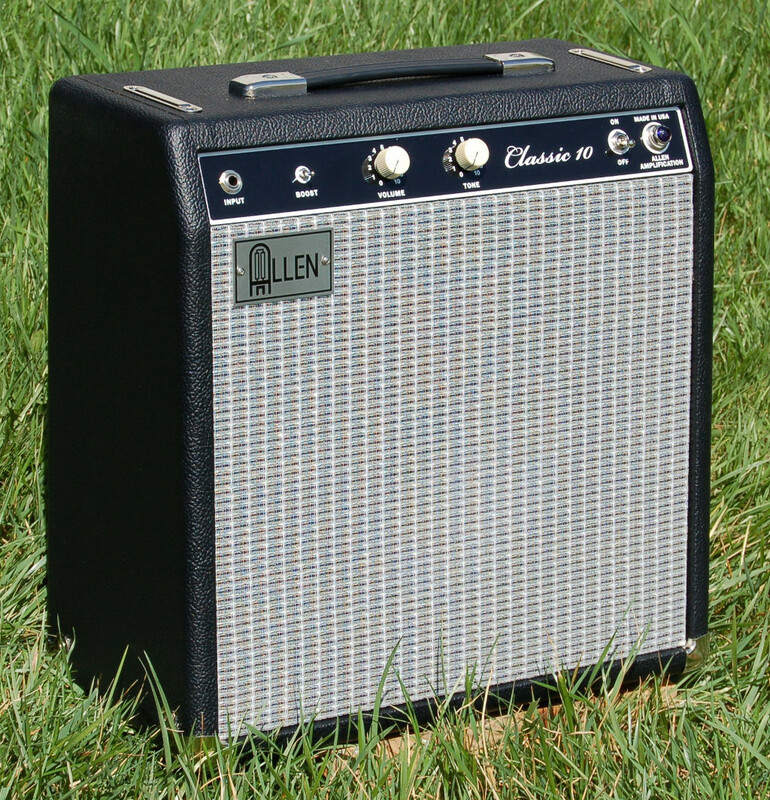 This beautiful little 10W, 25lb, $799 hand-wired tube amp is easy on the eyes, the ears, the back and the wallet! Features top quality components throughout as you have come to expect from Allen. Switchcraft jacks, Carling switch, Mallory tone caps, glass-epoxy eyelet board construction, best current production tubes and of course a stainless-steel chassis and finger-jointed pine cabinet. 8 foot grounded power cord, tube retainers, fuse holder and damped potentiometers with set-screw knobs and a power transformer made in Chicago USA! Also available as a head or a 1x8, 1x12 or 2x6 combo. Black/silver, blond/oxblood, blue diamond/blue silver, or blond with dark brown/black. Choice of knobs and pilot light jewel color. Many Eminence speaker options available. (1) 12AX7 preamp tube and (1) 6L6GC or EL34 power tube. Class A single-ended with cathode bias. TONE control to cut or boost highs, BOOST switch "ON" thins out bass. USA made TP24 power transformer and Heyboer TO11C output transformer. Loosely based on tweed Princeton 5F2-A but with more power, unique boost feature and a solid-state rectifier. Finger-jointed pine with Birch plywood floating speaker baffle and MDF back panels. Nickel plated bottom corners and glides, strap handle and chassis straps. Many Tolex and grill cloth options available. Eminence Copperhead 8 ohm speaker. Other Eminence speakers available. Cathode biased power tube can be a 6L6GC or an EL34. Unique BOOST switch pumps up the gain for more mids and highs and eliminates the negative feedback for a more Marshal like overdrive tone. 17"W by 17"H by 9"D and 24lbs. Also available in kit form! See the Kits & Cabs page. 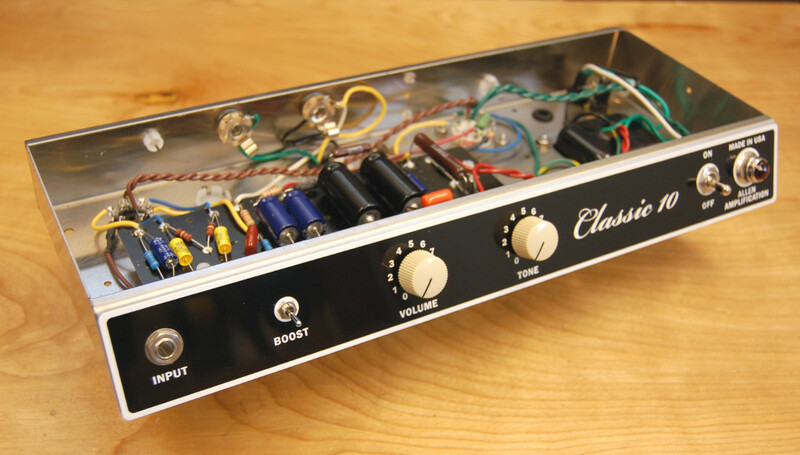 Classic 10 1x10 amp was used for these clips. Clips provided by The Sound LLC in Charlottesville, VA. Clips played by Ian Lawler on a PRS, Jason Butler on a rosewood necked Strat, or K.W. Miller on a 50's reissue Tele.